I have been so excited to try out my Silhouette with fabric! For this incredibly simple project I started out with a scrap piece of fabric, a $2 Ikea pillow, and a Clean Cut Fabric Interfacing sheet. The fabric interfacing iron-on sheet is really large enabling you to do several projects with your Silhouette. I cut a piece to the size of my scrap fabric and ironed the rough side of the interfacing to the backside of my fabric. Then I peeled off the backing and placed the material on one of my cutting sheets. Next, I chose the bird shape I wanted from the Silhouette store (for $.99), sized it to my liking, and printed it out. You can see that I peeled off the negative leaving the bird on the cutting sheet. Lastly, I ironed on my bird to my pillow and used washable fabric glue to secure any loose corners. Since my pillow was already intact, I wasn’t able to sew the bird to the pillow; however, with the addition of fabric glue this pillow should do fine in the wash.
From start to finish this project took me less than 20 minutes to complete! So much cuteness with such little effort! Do you have a Silhouette yet? If not, this promotion is for you! Also, readers that already have a Silhouette can get 25% off fabric interfacing. The March promotion will run from the 21st through the 27th. 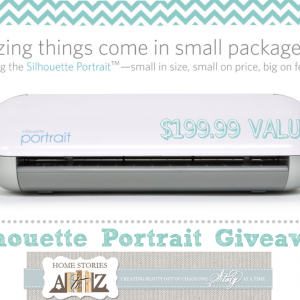 Use promo code “A2Z“at Silhouette America. hello there and thanks to your information ? I’ve certainly picked up something new from proper here. I did then again expertise some technical points the usage of this web site, since I skilled to reload the web site many occasions previous to I may get it to load properly. I had been pondering if your hosting is OK? Now not that I am complaining, but sluggish loading instances instances will often have an effect on your placement in google and can damage your high-quality score if ads and marketing with Adwords. Anyway I’m including this RSS to my e-mail and could glance out for much more of your respective interesting content. Make sure you update this again very soon..
LOL at your caption Put a bird on it- Portlandia! By the way, very nice bird and nest pillows. Lovely pillow. And so jealous of your Silhouette!!!! Woman! There is no stopping you and your Cricut!!! Very cute! I don't have a silhouette but the more I see these simple creations the more I realize that I need to invest! Hi Beth, I'm a new follower and new blogger. Loving the Silhouette Bird Pillow and the fabric. Your home is beautiful. Love the fabric you used! The pillow looks great! Thanks for sharing. I love both the pillows and especially love the fabric you used to cut the bird out of! Shoot there are all of these things that we have always lived without and now we have to have them. I love that pillow!! My husband ordered me a Silhouette for our anniversary so I am anxiously waiting it's arrival!! I'm so excited I can hardly stand it! I mean did they send u a special insert. Silhouettes are so cool. It is on my list of wants. Love the fabric and bird. I always want to make more pillows, but where to put them all? That is my dilemma. This is so cool! I'm really surprised it cut the fabric! Should try it out. Did u use any special cutter? You put a bird on it! 😉 My type of project. Beth, these are so cute! I made some pillows using iron on transfers. I may have to try something like yours with the great backgrounds too!